5 colours to highlight keywords and strikeout documental text, our Logo Branded Highlighters for Company Gift set is the ideal stationery item that will be used often and signify importance and brand awareness on a customer's desk. Customise this wonderful business gift set and send them out to ensure future business opportunities and offer a useful gift as a good-will gesture. The most perfect way to signify your corporate brand name with our Highlighters for Company Gift. You can't fail with this one! 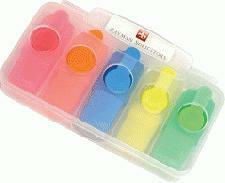 For a FREE QUOTE, please fill in the form regarding our Highlighters for Company Gift and we'll be able to help you.